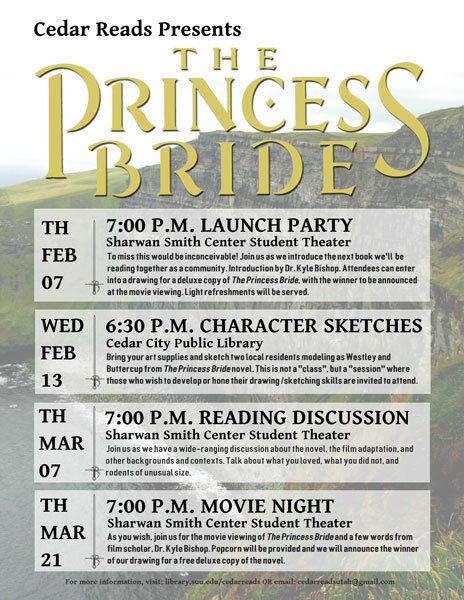 A series of four exciting events centered around film and novel The Princess Bride will be hosted by Cedar Reads this February and March 2019. Christopher Clark and Kyle Bishop from Southern Utah University will be hosting, with SUU and Cedar City Public libraries co-organizing and co-hosting. All four events are free and open to the public. To miss this would be inconceivable! Join us as we introduce the next book we’ll be reading together as a community. Introduction by Dr. Kyle Bishop. Attendees can enter into a drawing for a deluxe copy of The Princess Bride, with the winner to be announced at the movie viewing. Light refreshments will be served. Bring your art supplies and sketch two local residents modeling as Westley and Buttercup from The Princess Bride novel. This is not a “class” but a “session” where those who wish to develop or hone their drawing/sketching skills are invited to attend. Join us as we have a wide-ranging discussion about the novel, the film adaptation, and other backgrounds and contexts. Talk about what you loved, what you did not, and rodents of unusual size. As you wish, join us for the movie viewing of The Princess Bride and a few words from film scholar, Dr. Kyle Bishop. Popcorn will be provided and we will announce the winner of our drawing for a free deluxe copy of the novel.